Pour Tassel Ridge Iowa St. Croix Rosé into 9 x 13-inch glass baking dish. Freeze at least 6 hours or until almost solid (the alcohol will keep it from freezing solid). Meanwhile, combine water and sugar in medium saucepan. Bring to a boil, stirring constantly until sugar dissolves, about 3 minutes. Add strawberries. Remove from heat. Let stand about 30 minutes to infuse syrup with strawberry flavor. Strain into small bowl through fine-mesh strainer, without pressing on solids. Cover. Chill until cold, about 30 minutes. 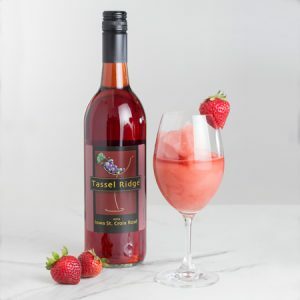 Scrape frozen Tassel Ridge Iowa St. Croix Rosé into blender. Add lemon juice, ½ cup strawberry syrup, and crushed ice. Purée until smooth. Put blender jar in freezer for 25 to 35 minutes. Remove from freezer. Blend until slushy. Serves 4–6.